European Space Agency astronaut Samantha Cristoforetti celebrated World Book Day in space on April 23, 2015 with this photo of five tiny books on the International Space Station. Italian astronaut Samantha Cristoforetti is not just a space traveler, she's apparently also a bibliophile who can't bear to be apart from her books, even while living off planet Earth. 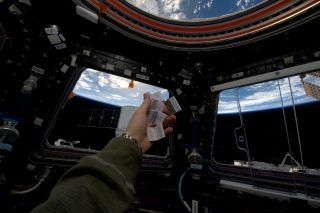 To show her love for books, Cristoforetti celebrated World Book Day today (April 23) with a photo of five teeny, tiny tomes floating in weightlessness on the International Space Station, with a view of the Earth serving as a picturesque backdrop. The diminuitive books are in different languages, including English, German and French. "I like reading books because they answer questions I didn't yet have ... #WorldBookDay," Cristoforetti wrote in a Twitter post accompanying the photo. She translated the message in English and Italian. Samantha Cristoforetti is an astronaut with the European Space Agency and part of a six-person crew currently living on the International Space Station. She has been chronicling her mission on Twitter, YouTube and other social media outlets to share her flight with the public. You can see more of Cristoforetti's space photos here. Last week, she donned a Star Trek uniform (apparently from the TV series "Star Trek: Voyager") to welcome the arrival of an unmanned SpaceX Dragon cargo ship carrying tons of supplies, including the world's first espresso coffee machine in space.